Portable CheckBeat is a simple checkbox-programmable sample-based drum machine with a user-configurable resolution from one quarter note to one thirty-second note. The user can set the BPM (any) and pattern length (up to 16). It was written using DirectX Audio. CheckBeat is a virtual drum machine designed for quickly creating simple beats. It can be used like a fancy metronome and is handy when you need to create a backing beat for a drummer-less jam session. Programming a beat is as simple as clicking a few checkboxes. It plays sound using .wav files, so you can use the built-in drum sounds, or any sound you can dream of. Portable CheckBeat is a small audio application whose purpose is to help you generate your own drum beats. The utility is created using XAudio2 API so you need to have Microsoft DirectX runtime installed on your system to make it work. This is the portable version of CheckBeat. You can keep it stored on USB flash drives or other portable devices and carry it with you all the time. Gaining access to the tool’s features requires only opening the executable file because there’s no installation included in the process. What’s more, you can open it without administrative privileges on the target computer and uninstall it using a quick deletion task because it does not leave entries in the Windows registry. You are welcomed by a clean and intuitive layout that accommodates all configuration settings into a single panel. A help manual is hidden under the hood and contains short descriptions about the program’s features. Portable CheckBeat gives you the possibility to create your own drum patterns by playing WAV files based on the pattern you create. The utility comes packed with several preset WAV files that you can choose from and allows you to add custom audio files from your computer. You are given the freedom to create patterns by checking the boxes below each WAV file and turning on the sound for the current beat. Each box corresponds to a 16-beat sequence. Other important tweaks worth being mentioned enable you to make the sequences shorter by setting the ‘Beats/Pattern’ to a number below 16, as well as alter the tempo and note duration per beat. Portable CheckBeat eats up minimal CPU and memory resources so the overall performance of the computer is not hampered. 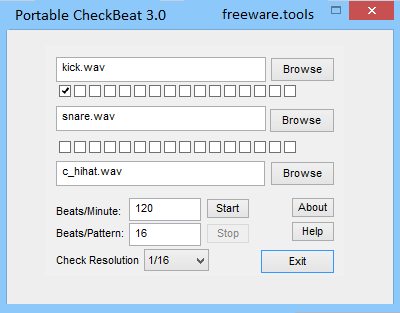 All things considered, Portable CheckBeat offers a simple and quick method for generating drum beats, and is suitable especially for less experienced users.